Acute bronchitis, also known as a chest cold, is short-term inflammation of the bronchi (large and medium-sized airways) of the lungs. The most common symptom is a cough. Other symptoms include coughing up mucus, wheezing, shortness of breath, fever, and chest discomfort. The infection may last from a few to ten days. The cough may persist for several weeks afterward with the total duration of symptoms usually around three weeks. Some have symptoms for up to six weeks. Figure A shows the location of the lungs and bronchial tubes. Figure B is an enlarged view of a normal bronchial tube. Figure C is an enlarged view of a bronchial tube with bronchitis. In more than 90% of cases the cause is a viral infection. These viruses may be spread through the air when people cough or by direct contact. Risk factors include exposure to tobacco smoke, dust, and other air pollution. A small number of cases are due to high levels of air pollution or bacteria such as Mycoplasma pneumoniae or Bordetella pertussis. Diagnosis is typically based on a person's signs and symptom. The color of the sputum does not indicate if the infection is viral or bacterial. Determining the underlying organism is typically not needed. Other causes of similar symptoms include asthma, pneumonia, bronchiolitis, bronchiectasis, and COPD. 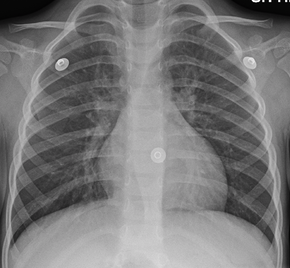 A chest X-ray may be useful to detect pneumonia. Prevention is by not smoking and avoiding other lung irritants. Frequent hand washing and flu vaccination may also be protective. Treatment of acute bronchitis typically involves rest, paracetamol (acetaminophen), and NSAIDs to help with the fever. Cough medicine has little support for its use and is not recommended in children less than six years of age. Salbutamol is not effective in children with an acute cough who do not have restricted airways. There is weak evidence that salbutamol may be useful in adults with wheezing due to a restricted airway; however, it may result in nervousness, shakiness or a tremor. Antibiotics should generally not be used. An exception is when acute bronchitis is due to pertussis. Tentative evidence supports honey and pelargonium to help with symptoms. 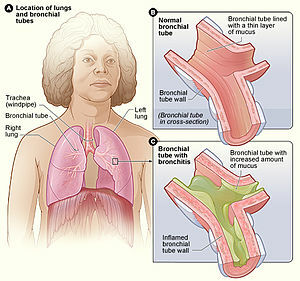 Acute bronchitis is one of the most common diseases. About 5% of adults are affected and about 6% of children have at least one episode a year. It occurs more often in the winter. More than 10 million people in the United States visit a doctor each year for this condition with approximately 70% receiving antibiotics, most of which are not needed. There are efforts to decrease the use of antibiotics in acute bronchitis. Bronchitis may be indicated by an expectorating cough, shortness of breath (dyspnea), and wheezing. On occasion, chest pains, fever, and fatigue or malaise may also occur. In addition, bronchitis caused by Adenoviridae may cause systemic and gastrointestinal symptoms as well. However, the coughs due to bronchitis can continue for up to three weeks or more even after all other symptoms have subsided. Acute bronchitis can be caused by contagious pathogens, most commonly viruses. Typical viruses include respiratory syncytial virus, rhinovirus, influenza, and others. Bacteria are uncommon pathogens but may include Mycoplasma pneumoniae, Chlamydophila pneumoniae, Bordetella pertussis, Streptococcus pneumoniae, and Haemophilus influenzae. Damage caused by irritation of the airways leads to inflammation and leads to neutrophils infiltrating the lung tissue. Mucosal hypersecretion is promoted by a substance released by neutrophils. Further obstruction to the airways is caused by more goblet cells in the small airways. This is typical of chronic bronchitis. Although infection is not the reason or cause of chronic bronchitis, it is seen to aid in sustaining the bronchitis. A physical examination will often reveal decreased intensity of breath sounds, wheezing, rhonchi, and prolonged expiration. Most physicians rely on the presence of a persistent dry or wet cough as evidence of bronchitis. A chest X-ray is useful to exclude pneumonia which is more common in those with a fever, fast heart rate, fast respiratory rate, or who are old. A sputum sample showing neutrophil granulocytes (inflammatory white blood cells) and culture showing that has pathogenic microorganisms such as Streptococcus species. A blood test would indicate inflammation (as indicated by a raised white blood cell count and elevated C-reactive protein). Prevention is by not smoking and avoiding other lung irritants. Frequent hand washing may also be protective. Furthermore, an oral whole cell nontypeable Haemophilus influenzae vaccine may protect against the disease, but "the evidence is mixed". Most cases are self-limited and resolve themselves in a few weeks. Pain medications may help with symptoms. Other recommendations may include rest and keeping well hydrated. Evidence does not support the general use of antibiotics in acute bronchitis. A systematic review found antibiotics reduced cough by an average of 12 hours (out of a total average of about 14–28 days). Antibiotics caused more side effects such as nausea and diarrhoea, and also may promote antibiotic-resistant bacteria. It is possible they are useful in susceptible groups such as the frail and elderly but there was not enough research information to determine this. To help the bronchial tree heal faster and not make bronchitis worse, smokers should quit smoking completely. Acute bronchitis usually lasts a few days or weeks. It may accompany or closely follow a cold or the flu, or may occur on its own. Bronchitis usually begins with a dry cough, including waking the sufferer at night. After a few days, it progresses to a wetter or productive cough, which may be accompanied by fever, fatigue, and headache. The fever, fatigue, and malaise may last only a few days, but the wet cough may last up to several weeks. Should the cough last longer than a month, some physicians may issue a referral to an otorhinolaryngologist (ear, nose and throat doctor) to see if a condition other than bronchitis is causing the irritation. It is possible that having irritated bronchial tubes for as long as a few months may inspire asthmatic conditions in some patients. In addition, if one starts coughing mucus tinged with blood, one should see a physician. In rare cases, physicians may conduct tests to see whether the cause of the bloody sputum is a serious condition such as tuberculosis or lung cancer. Acute bronchitis is one of the most common diseases. About 5% of adults are affected and about 6% of children have at least one episode a year. It occurs more often in the winter. In infants under one year of age, acute bronchitis was the most common reason for admission to the hospital after an emergency department visit in the US in 2011. ^ a b c d e f g h i j k l m n o p Albert, RH (1 December 2010). "Diagnosis and treatment of acute bronchitis". American Family Physician. 82 (11): 1345–50. PMID 21121518. ^ a b c d e f g h "What Is Bronchitis?". August 4, 2011. Archived from the original on 2 April 2015. Retrieved 1 April 2015. ^ a b c d e f g Tackett, KL; Atkins, A (December 2012). "Evidence-based acute bronchitis therapy". Journal of Pharmacy Practice. 25 (6): 586–90. doi:10.1177/0897190012460826. PMID 23076965. ^ a b "How Is Bronchitis Diagnosed?". August 4, 2011. Archived from the original on 2 April 2015. Retrieved 1 April 2015. ^ a b c d e "How Can Bronchitis Be Prevented?". August 4, 2011. Archived from the original on 2 April 2015. Retrieved 1 April 2015. ^ a b "How Is Bronchitis Treated?". August 4, 2011. Archived from the original on 2 April 2015. Retrieved 1 April 2015. ^ a b c d e f g Wenzel, RP; Fowler AA, 3rd (16 November 2006). "Clinical practice. Acute bronchitis". The New England Journal of Medicine. 355 (20): 2125–30. doi:10.1056/nejmcp061493. PMID 17108344. ^ a b c Fleming, DM; Elliot, AJ (March 2007). "The management of acute bronchitis in children". Expert Opinion on Pharmacotherapy. 8 (4): 415–26. doi:10.1517/14656566.8.4.415. PMID 17309336. ^ "What Causes Bronchitis?". August 4, 2011. Archived from the original on 2 April 2015. Retrieved 1 April 2015. ^ Singh, Anumeha; Zahn, Elise (2018). Acute Bronchitis. StatPearls Publishing. Retrieved 23 January 2019. ^ Smith, SM; Schroeder, K; Fahey, T (24 November 2014). "Over-the-counter (OTC) medications for acute cough in children and adults in community settings". The Cochrane Database of Systematic Reviews. 11 (11): CD001831. doi:10.1002/14651858.CD001831.pub5. PMID 25420096. ^ a b Becker, Lorne A.; Hom, Jeffrey; Villasis-Keever, Miguel; van der Wouden, Johannes C. (2015-09-03). "Beta2-agonists for acute cough or a clinical diagnosis of acute bronchitis". The Cochrane Database of Systematic Reviews (9): CD001726. doi:10.1002/14651858.CD001726.pub5. ISSN 1469-493X. PMID 26333656. ^ a b Smith, SM; Fahey, T; Smucny, J; Becker, LA (19 Jun 2017). "Antibiotics for acute bronchitis". The Cochrane Database of Systematic Reviews. 6: CD000245. doi:10.1002/14651858.CD000245.pub4. PMID 28626858. ^ a b c Braman, SS (January 2006). "Chronic cough due to acute bronchitis: ACCP evidence-based clinical practice guidelines". Chest. 129 (1 Suppl): 95S–103S. doi:10.1378/chest.129.1_suppl.95S. PMID 16428698. ^ Chang, Anne B.; Upham, John W.; Masters, I. Brent; Redding, Gregory R.; Gibson, Peter G.; Marchant, Julie M.; Grimwood, Keith (March 2016). "Protracted bacterial bronchitis: The last decade and the road ahead". Pediatric Pulmonology. 51 (3): 225–242. doi:10.1002/ppul.23351. ISSN 1099-0496. PMID 26636654. ^ Teo, Edward; House, Hugh; Lockhart, Kathleen; Purchuri, Sai Navya; Pushparajah, Jennifer; Cripps, Allan W; van Driel, Mieke L (2014). "Haemophilus influenzae oral vaccination for preventing acute exacerbations of chronic bronchitis and chronic obstructive pulmonary disease". The Cochrane Database of Systematic Reviews (9): CD010010. doi:10.1002/14651858.CD010010.pub2. PMID 10796676. ^ "Diagnosing and treating acute bronchitis". American Lung Association. Retrieved 24 January 2019. ^ Smith, Susan M.; Fahey, Tom; Smucny, John; Becker, Lorne A. (19 June 2017). "Antibiotics for acute bronchitis". The Cochrane Database of Systematic Reviews. 6: CD000245. doi:10.1002/14651858.CD000245.pub4. ISSN 1469-493X. PMID 28626858. ^ "Bronchitis". Mayo Foundation for Medical Education and Research. 2007-04-20. Archived from the original on 2008-03-25. Retrieved 2008-05-30. ^ Weiss, A.J. ; Wier, L.M. ; Stocks, C.; Blanchard, J. (June 2014). "Overview of Emergency Department Visits in the United States, 2011". HCUP Statistical Brief #174. Rockville, MD: Agency for Healthcare Research and Quality. Archived from the original on 2014-08-03. Wikisource has the text of the 1911 Encyclopædia Britannica article Bronchitis.